This lengthy recipe title requires a bit of explanation. For starters, you may be wondering why this is a “princess” pound cake and not just a regular pound cake. I wish I could answer this question but it just so happens that “Princess Cake” is the title of this cake recipe in “The Art of Fine Baking.” In an introduction to this recipe, my grandmother mentions that this is a replacement for ordinary pound cake but why she calls it a Princess Cake remains a mystery. My guess is that it somehow refers to the light fluffiness of the cake, which is made with just egg whites and not yolks, like her regular pound cake recipe. I actually prefer the airiness of this cake to the more dense pound cake. It also works well in this strawberry shortcake-like dessert. I tend to struggle to find summer recipes in both “The Art of Good Cooking” and “The Art of Fine Baking” as well as my grandmother’s unpublished recipes. This may be because she spent most summers traveling through France and eating at all the best restaurants (don’t we all wish we could?). The lack of what we now consider seasonal recipes, requires me to be a bit more creative. In this case, I wanted to take advantage of the sweet summer peaches (with a few apricots) that have premiered at the farmers markets and are becoming more prominently displayed. 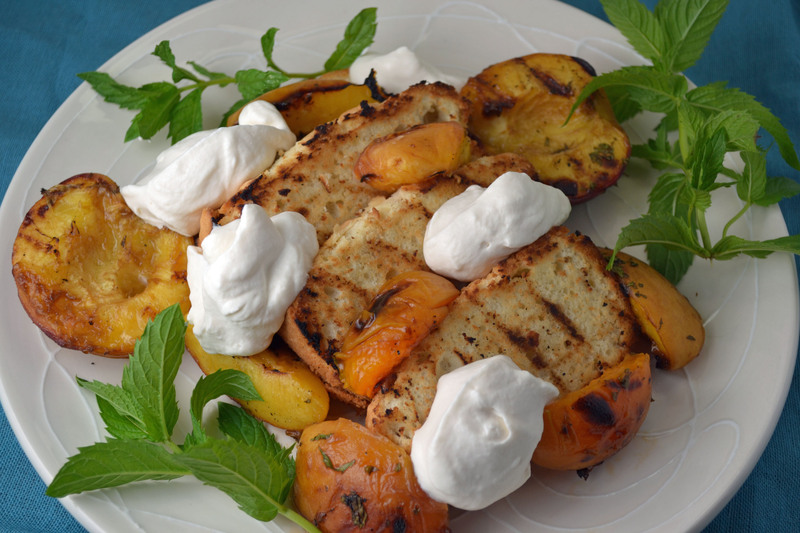 The simpler version of this dish is to just grill the peaches and serve over sliced pound cake with a dollop of whipped cream. Nothing wrong with that. I just decided to take it to the next level by grilling the pound cake and mixing the fruit with a little brown sugar, balsamic vinegar, and chopped mint. This marinade along with juices of fruit produce a caramelized sauce that drips off the fruit after it has been grilled and is delicious on the pound cake (which is basically toasted). It might be fancier to replace the whipped cream with mascarpone but the contrast of flavors and textures of the fruit and cake alone need nothing more than the lightness of sweetened whipped cream to bring it all together. Preheat oven to 350 degrees. Grease a 9 x 5 x 3 loaf pan and dust with flour. Cream butter and half the flour until light and fluffy. Add vanilla. Beat egg whites with salt and cream of tartar until they hold soft peaks. Add sugar, a tablespoon at a time, beating well after each addition. Beat whites at least 5 minutes or until they are very firm. Quickly stir 1/4 of beaten egg whites into creamed butter-flour mixture. Pour mixture back over remaining egg whites. Fold genly together while sprinkling in remaining flour. Be careful not to overmix. Pour into prepared pan. Bake about 45 minutes or until cake is golden brown and pulls away from the sides of the pan. Note: For balsamic marinade, mix cut fruit with 2-3 tablespoons balsamic vinegar, 3-4 tablespoons brown sugar, and 1-2 tablespoons chopped mint. Measurements will depend on the sweetness of the fruit. Marinate for 15 minutes before grilling.